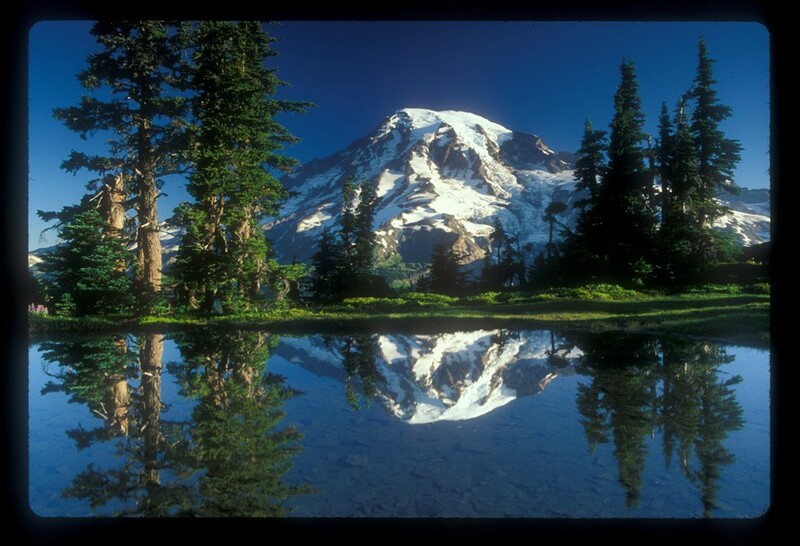 Ron Warfield is a photographer of many years’ experience, and his primary subject has been the majestic Mount Rainier. During the recent Open Studio Tour, my husband, Mark, and I visited his photographic art exhibit in the Holly Hut shop in Eatonville. Mr. Warfield has been expressing his singular devotion by photographing Mount Rainier for the last twenty-six years – and in all seasons. The above photograph of Mount Rainer was taken by Ron Warfield. The intimate relationship Ron has with the mountain derives from the fact that he worked there for years as a park service ranger. He has shared what he’s seen and learned with people from all over the world. When it comes to education about Mount Rainier, there’s plenty to learn. The mountain creates its own weather and environmental conditions, which can vary moment-by-moment throughout any given day. But it’s the soul-touching beauty of the mountain that Ron captures in the nearly 80,000 photos he has taken. In one, taken above Myrtle Falls, two boulders hold back a pond. Cascades of pure, fresh-air water gush between them, while above, Mount Rainier gazes over fields of wild flowers. Anyone who has been a photographer through so many years must have seen vast changes in the profession, so I asked Ron to share his thoughts. We hadn’t before considered that photography may be at risk of loss to modernity. We wondered why that matters – what is different that is so worth preserving? While Ron talked, another photograph caught our eyes. This one was taken from further south than the first. In it, flowers sprinkle the foreground like salt and pepper, with a mix of purple-blue lupines and yellow-eyed daisies. It captures one of Mother Nature’s innumerable floral designs. He directed our attention to another photo. In it, clear skies serve as a backdrop to Mount Rainier. A band of forest trees below the mountain separates it from the mist along the waterline of a lake and the mountain’s reflection upon its waters. Beneath, a wide spray of wild lavender lupines is splayed in the foreground like a hand of cards against deep, sky-blue waters. We felt a hollowness – a sense of loss, which extended to the uncertain future of photography. “When the world of black and white first went to color, everyone switched and the finesse of black and white was largely lost. It’s true, we agreed, that anyone can snap off countless photos until he or she takes one that will do. But that approach seems to draw heavily on luck, and much is lost in detail. That was a proud statement, which came from the lips of a humble man. Ron paused thoughtfully before continuing. 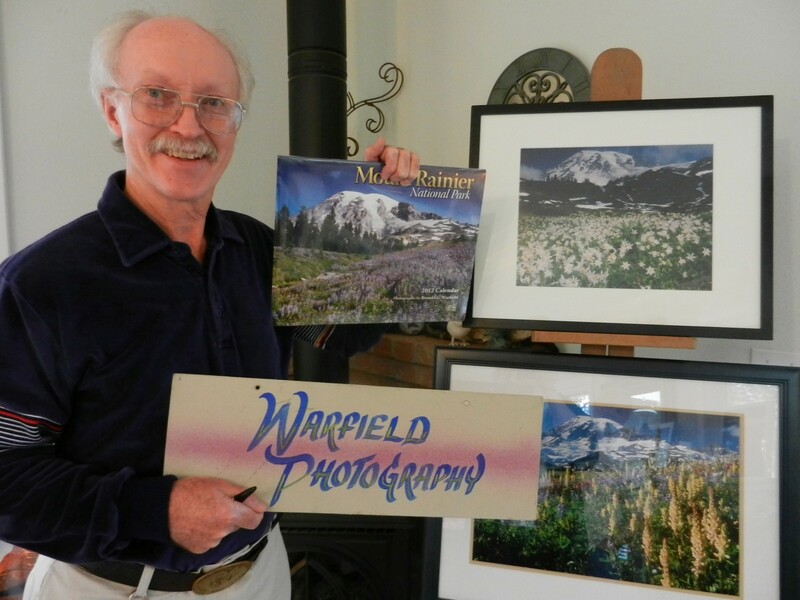 Ron Warfield posing along side some of his photographs of Mount Rainier. That comment made us really stop and think. Perhaps we all owe it to ourselves to take the time to learn about that kind of photography and to care enough to preserve it. We concluded our tour with a photograph taken from Longmire at sunset. Shadows were fast-falling all around; lavender-tinted snow clung to Mount Rainier like too-moist frosting, while winds at the top blew up soft, misty billows of snow. Mount Rainier is a national treasure that is known all over the world. So is Ron Warfield, the photographer who belongs to the mountain. We are privileged to have this world-class photographer here in our own local area. As we took our leave, we purchased Ron’s 2012 calendar featuring photographs selected by his own hands. It will be our way to enjoy a different view of Mount Rainier every month all next year, for the Mountain is very much in my heart. I grew up on a farm in Enumclaw at the foot of Mount Rainier, and she had oversight on all our life’s activities. To see additional photos of Ron’s work go to www.AGpix.com/Warfield, (an overall site for many photographers), and click on “Images” in the blue bar at the top. The Phototripusa site http://www.phototripusa.com/e_gallery_0999.html has some of his images as well. 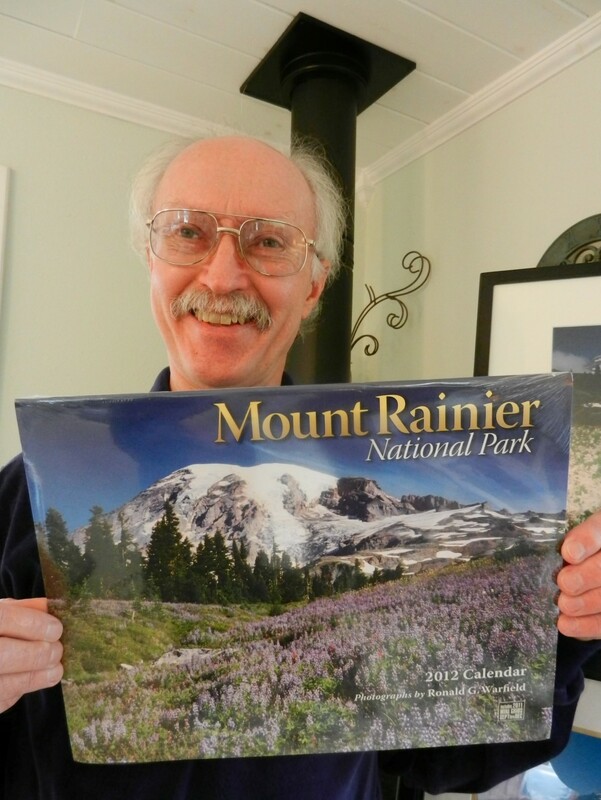 Ron’s “Magnificent Mount Rainier” gallery ran in September 1999, but the story and images are timeless. If you wish to follow up on any of those images, Ron can be reached by email at rbwarfield@juno.com, or by phone at (360) 832-3061. This entry was posted in Culture, Eatonville News, Events, Judy Spiers. Bookmark the permalink. Yes Ron is a wonderful photographer. One of his paintings was nominated as the Peoples Choice during our annual Mt. Rainier Show in October, 2011 at the Gallery on the Hill aka Lucas Art, in Graham, WA. His 2012 calendar is available in the gallery during the holidays.